What if I were to tell you that successful dog training doesn’t depend on your energy, your dog’ s breed, your dog’s personality, or whether your dog is “dominant?” What if I asked you to throw out everything you think you know about training, take out a blank sheet of paper, and write down three questions? Then, what if I told you that before attempting to teach anything to your dog, you had to answer those three questions? Questions form the basis for much of society’s complex and life-changing ideas. Before a researcher embarks on an experiment, she has to articulate a hypothesis: a question that can be tested and measured, supported or unsupported on the basis of quantifiable data. If the question is irrelevant, vague or misguided, the resulting experiment will be unsuccessful. The same principles apply in dog training. I recently had a lightbulb moment when listening to a dog training webinar given by my teacher and mentor, Jean Donaldson. She wisely stated that in training, just as in other areas of science, success depends not just on asking questions, but asking the right questions. If a trainer asks the wrong questions, she will find herself wandering the desert with no clear path or destination. If she asks the right questions, she will stay on course. Dog training pop culture provides a vast thicket of wrong questions that confuse owners and jeopardize training. Asking whether a dog is dominant is most definitely a wrong question. So is asking whether a dog is being disobedient, or whether a dog owner is providing the right amount of leadership. In addition to not being based on the science of how animals learn and why they behave, they can also paralyze well-meaning owners who simply want a safe, harmonious relationship with their dogs. What am I asking my dog to do? Let’s go through each of these one by one. 1. Is my dog upset? This question is critical because the answer determines what type of training technique you should use on your dog. If your dog is upset (think fearful or frustrated), you use classical conditioning to change your dog’s associations with his environment. If your dog is barking and lunging at strangers, and you punish your dog each time the barking and lunging occurs, you aren’t going to get very far, and could potentially make the problem worse. If you change your dog’s associations to strangers so that he no longer fears them, he will no longer feel the need to bark and lunge. If your dog is not upset, you use operant conditioning to teach your dog which behaviors work, which don’t, and under what circumstances he needs to perform them. 2. What am I asking my dog to do? 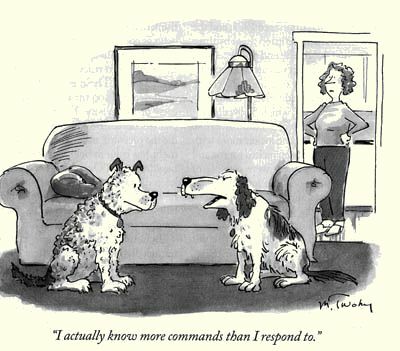 Communicating effectively with dogs is difficult. If we don’t know what we want our dog to do, and under what conditions, our dogs certainly won’t either. This confusion fosters frustration, slow learning, and a breakdown in you and your dog’s lines of communication. Instead of saying “I want Fido to listen to me,” say: “I want Fido to come when called at the dog park, even if there are other dogs or people present, from a distance of 20 feet or less.” This answer to the question is much more relevant to you and your dog. You now know what behaviors you need to teach your dog, and what level of difficulty you need to achieve. Instead of saying “I want Fido to be obedient,” say: “I want Fido to learn ‘sit,’ ‘stay,’ and ‘down’ on a verbal cue in the house.” The latter is objective, measurable, and is something your dog will understand. 3. Why should my dog do what I am asking? This final question alludes to the golden nugget in dog training: Motivation. Dogs need a reason to do what we ask of them. And that reason has to be more than simply praise and a pat on the head. Most of the behaviors we teach our dogs are incredibly difficult and boring. Why should a dog come running to you when there are squirrels, other dogs and picnic food on the other side of the park? Why should your dog leave tasty, day-old pizza on the sidewalk? We need to give dogs a very good reason – a reason that trumps all other distractions and motivations – to listen to us. If your dog isn’t doing what you ask, determine whether you’re making it worth his while. Maureen Backman, MS is the owner of Mutt About Town dog training in San Francisco. She is also the founder of The Muzzle Up! Project. To get in touch, email her at muttabouttownsf@gmail.com. Soooo well written. I am saving the blog post to use as discussion when I teach animal behavior to veterinary technician students. Love it.